To be an advocate for area youth in the performing arts and to create awareness of the power of the arts to enhance self-esteem, to increase understanding of others, and to improve academic performance. The Bluebird Foundation announces that the Taste of Duluth grant application process for high school age students will begin May 1, with applications available at bluebirdfoundation.org. These grants are available to high school aged kids (effective fall 2018 school year) 9th grade to 12th grade. Current graduating seniors are also eligible. Kids in any category of the performing arts can apply: music, dance, theater. Applications and recommendation letters are due June 27th at 4PM. 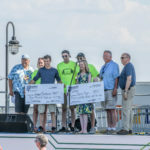 Awardees must be able to attend the ceremony at Taste of Duluth on Saturday, July 14th. Courtesy of the Cloquet Eagles Club 1163 This award is open to any high school age kid in the performing arts. The Late Jim Putnam was the Eagle’s President for 7 years from 2006-2013 and let the group through rough times. Celebrating 112 years of People Helping People. The Cloquet Eagles have a rich history of helping the community. Supporting the arts is one of the group’s passions. To date, the foundation has awarded $26,000 to area high school aged kids in the performing arts.